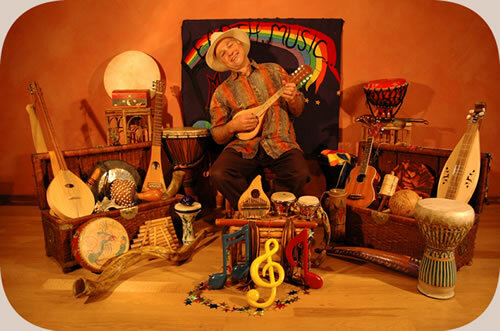 Bill Kehl’s “Earth, Music…Magic!” is a fun, interactive and exciting educational musical enrichment presentation featuring primitive musical instruments, and celebrating the creative exploration of human expression through sound. Showcasing a fascinating and colorful collection of unique and authentic musical instruments from all over the world, “Earth, Music…Magic!” is an engaging performance highlighting songs, stories, humor and joyful spontaneous audience participation. Aspects of ecology, science, history, geography and musicology are interwoven into the program as well, depending upon the age group of the audience. Learning about the natural world and discovering the simple beauty of primitive musical instruments… it’s a magical combination designed to leave you even more inspired about the wonder of the our beautiful planet home! I’ve always had a very soft spot in my heart for “Earth, Music…Magic!” and what the essence of this program is really about… human beings first discovering the wonders of the earth, sound, and ultimately, the gift of music. The beginnings of this program trace back to the early 1980’s, when as a member of the quartet Northern Light, I co-submitted a grant proposal to the Wisconsin Arts Board to help fund a series of programs for rural Wisconsin libraries about primitive world music. (At that time, all of my primitive instruments fit into one box… oh, for the good old days!) The proposal was accepted, Northern Light completed the grant performance series, and I was just beginning to discover a newfound passion that still continues to burn today. “Earth, Music… Magic!” has changed over the years, but my enthusiasm for sharing it with children of all ages and abilities has not faded… I look forward to sharing this program with your community! Click here for more information about Earth, Music…Magic!